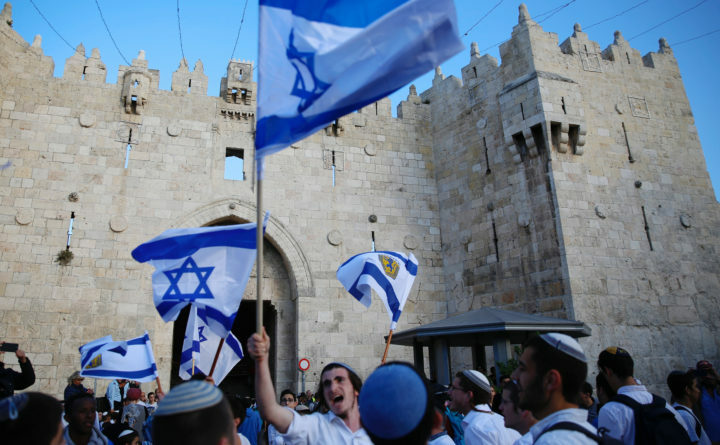 Israelis wave national flags outside the Old City's Damascus Gate, in Jerusalem, May 13, 2018. Israel's parliament has approved a controversial piece of legislation that defines the country as the nation-state of the Jewish people. Opponents and rights groups have criticized the legislation, warning that it will sideline minorities such as the country's Arabs. JERUSALEM — Israel’s parliament approved a controversial piece of legislation on Thursday that defines the country as the nation-state of the Jewish people but which critics warn sidelines minorities. Israel’s 1948 declaration of independence defined its nature as a Jewish and democratic state, a delicate balance the country has grappled to maintain for 70 years. Opponents of the new bill say it marginalizes the country’s Arab minority of around 20 percent and also downgrades Arabic language from official to “special” standing.